← Best ghost story since The Others: The Orphanage. The ghost from room 107. I think we may have a ghost at the hotel. (Possibly more than one, but the story of room 217 is for another post.) If we do, it is a non-confrontational spirit – one that just flickers at the edge of my awareness, late at night. There have been no full-bodied apparitions, no objects mysteriously moved. Sometimes, though, when I am bent over paperwork, I peripherally see a dark shape walk past the corner of the desk, toward the main entrance. Sometimes, when I am washing my hands in the employee restroom, I get the feeling that someone is in the laundry room beyond the bathroom door – perhaps near the triple sink across the room, perhaps around the corner of the washing machine, near the fridge. My sense is that the presence is male, and my logic tells me that he would likely be the revenant of a suicide that happened, before my time, in room 107. When I first started working at the hotel, my coworkers were eager to share stories of all the scary things that had happened there during their employment. I was told of medical emergencies, drug overdoses and domestic disputes. (One involving a gun.) Don’t get me wrong. I work at a nice, mid-range, chain hotel, in a fourth-ring suburb. Most of the guests are business people in town for a meeting, or families on their way to vacation destinations up north. Some people, however, go to hotels for much darker reasons, and one of those reasons is to die quietly, leaving no muss for loved ones at home to discover. I would be surprised to find a hotel (more than a couple of years old) that had never sheltered a successful suicide. My understanding of the story of ‘our’ suicide is incomplete. Different employees seem to have different versions in their heads, and none of them seems able or willing to come out and tell everything that happened. (My suspicion is that the clerk on duty that night no longer works at the hotel.) I’ve heard there was a lot of blood for the housekeepers to deal with, but I’ve also heard that it was a simple overdose. I believe the victim was male, but I have no idea how old he was, or if he acted differently from any other guest checking into the hotel. The one thing everyone agrees on is that it happened in room 107. 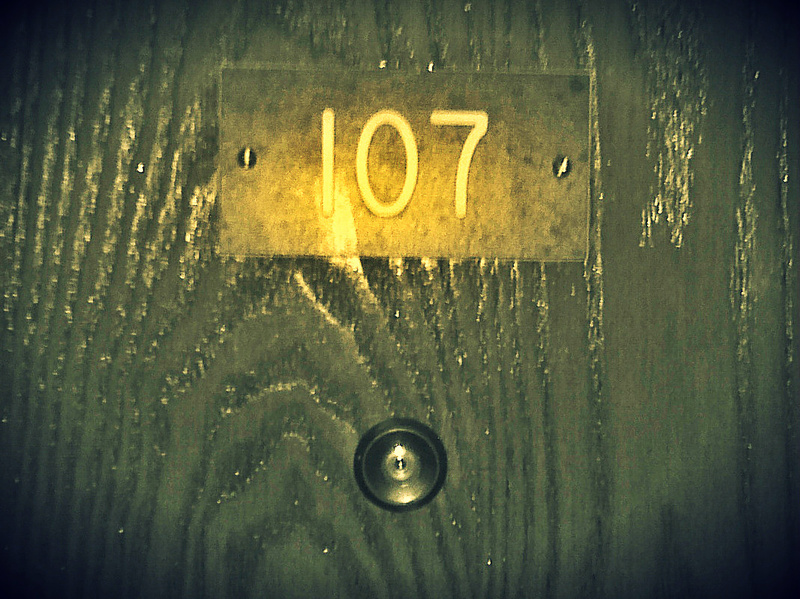 If the door to room 107 were just one or two strides nearer, it would be visible from the front desk. That thought bothers me. Had he lost his nerve, it would have only taken a few steps, or a loud shout, to summon help. At the first opportunity, of course, I visited the room. It was late. The hotel was near-empty. I carried the house phone with me so I could answer any calls, but I didn’t expect it to ring. Because it is a smoking room, I also took my cigarettes and an ashtray along. It’s an ordinary room. There is one queen bed wearing a shiny floral bedspread, flanked by two nightstands. At the bed’s foot, a sturdy dresser holds a lamp and a small television. In the corner, near the window, there is a round table. Pulled up near the table is an armchair, upholstered in tan vinyl. The vinyl was clammy when I sat down. I kicked off my shoes, brought my legs up under myself, and lit a cigarette. No pictures adorned the walls. The red digits of the alarm clock blinked 12:00. A small black beetle crawled across the snowy-white pillow on the left half of the bed. Other than that, nothing moved. Nothing happened. Except, well, except that I became progressively sadder as I smoked and waited and watched. When my cigarette burned down to the filter, I stubbed it out and stood. The carpet felt damp to my feet, so I hurried to slip back into my sandals. I didn’t switch off the lights until I could do it from the safety of the bright hallway. I’m not convinced that what I felt in room 107 was in any way paranormal. Being alone in such an inexpensive, nondescript hotel room is simply depressing. On top of that, this particular room has a distinct and special air of abandonment, because the other clerks avoid renting it out until they have to. (Though one told me she deliberately gives it to guests who irritate her when they come in.) I think the housekeeping staff hurries to clean it and get out when it has been rented. The bedspread is often askew and they frequently forget to stock it properly. It wasn’t until after my visit to room 107 that I began to notice the sense of a presence in the laundry room, and the shadow that seemed to move past the desk. The paranormal investigator in me jumps to the obvious conclusion – that a lonely, unhappy spirit latched onto a naive hotel clerk, freeing itself to roam beyond its former prison – but I don’t really believe that. I realize that the human imagination is vulnerable to the kind of atmosphere that exists in a sprawling hotel in the middle of the night. I realize that I’m sleep-deprived much of the time, and that it’s not surprising that I occasionally think I see something move from the corner of my eye. See how tidy it all becomes? This is how ghost stories are made. Now that I can see the progression so clearly, I should come to the conclusion that there is no such thing as a real haunting, don’t you think? But I don’t. Instead I wonder exactly what I have experienced. More accurately, I second guess my experiences. In an effort to sort things out, sometimes I write about what I think I experience, which – given time – solidifies the story I’ve crafted even more. Am I talking myself into – or out of – believing in paranormal phenomena? Unfettered imagination or impressions from a haunting? That is ultimately always the question. Yes, it is. And, really, that question is the reason I want to write about what “haunted” places feel like. I think you’re remaining open-minded but also keeping a healthy skepticism. These are good things! Healthy skepticism … good phrase. If I weren’t at least a little skeptical, I fear I’d freak out on those lonely overnights. I’m glad to know that if you annoy clerks they will give you the suicide room. That is useful cautionary information. Love this. I’d be disappointed if an old hotel wasn’t haunted! I wasn’t sure that it would be … it looks like such a standard, suburban chain hotel. When I thought about all the things that have happened within its walls, though, I tried to keep an open mind. Not to sound like an idiot (I’m technologically inept), is this what they call a blog? Either way I consider myself lucky that this is the first one I’ve ever stumbled onto. I can’t wait to read more. You are an excellent writer in my opinion or it just happens to be my style to enjoy reading it. Suicides really bother me and your story rm 107 really stirred up all the emotions that I feel when I hear about one. The funny thing (not that there is really anything funny about it) is that it’s all really your writing and the visuals and emotions it evokes because almost none of this if any other than the room number is based on fact. Sorry if this comment is in the wrong place. Like I said I have no idea what I’m doing here on the technological end but I’m fascinated by this “blog”. This particular blog is like a combination of a diary and a themed magazine, where all the articles are written by the same person. Not all blogs are like this one, but it’s a fairly common approach to blogging. Thank you for the kinds words about my writing. Good one, Renae. Lovely writing as always, but an even better story. I have to tell you, though, that those things seen on the periphery of MY vision have turned out to be floaters. Not the mice, roaches, or ghosts that I first thought. I will continue to believe that you are too young for floaters and that your peripheral vision provides you with glimpses between the worlds! Thanks, Zip. 🙂 I went through a phase where I thought I saw roaches everywhere! Do you know that story? My mother bought a chair at a church yard sale and gifted it to my household. I shampooed it, using a little hand-held thing I had, and put it in the living room. Late one night, not long after, I sat in the chair to watch a little TV in the dark. Then something crawled onto me. It was, of course, a roach, and I FREAKED OUT. It’s was, like, 3 AM but that didn’t stop me from screaming my fool head off. My daughter woke up to find me wrestling the chair down the stairs and out the front door. That same night, she helped me tear the living room apart so we could vacuum and scrub everything. We found several more! You know, I think, that I’m pretty “green” about most things, but, as soon as businesses opened the next day, I called in the pros and had everything fumigated. I only ever found one more roach after that first night. It was dazed and already half-dead from the chemical assault, I suspect. That did not stop me from thinking I saw them skittering about for months after. This over-blown reaction is a MN thing, I think. Up here, we don’t have to deal with this kind of thing often because of the hard freezes. (I guess.) A home with even one roach (as if there is such a thing) is considered filthy, here in the land of uptight Germans and Nordic-types. One thing that I’m NOT looking forward to when we move to NC is that I KNOW they are more common there. It’s funny that this post got three comments (including yours) all in the same day, even though it’s a couple of years old. How did you come across it, if you don’t mind me asking? Three years old? How weird. It showed up in my email as a new post. And of course, I don’t bother with the details, like dates. Loved your roach story. I grew up in NJ and have lived through both roach and earwig infestations. When we moved to Omaha, I made up a story about the ‘mother roach’ living in our then basement. I scared myself so badly with the story – the mother roach is big as a house and comes for people who kill too may of her babies – that I wouldn’t go down to the basement for 7 years. And of course, that’s where the washer and dryer were located. My first husband discovered that wash was now his bailiwick. As for NC, I’d hire the exterminator before you arrive! Lovely, just lovely. I’m not sure what else to say. The writing, the story, the speculation, and the imagination of the writer made this a delight to read and has left me smiling as I am currently on vacation in the Southwest (New Mexico & Texas) doing what others may seen as just taking it all in. I call it research. My next novel is going to be set out this way and everything I see, feel, smell, hear, taste and sense with my soul that strikes me strongly, finds itself jotted down of in my ever present notebook. Your story, too, may find some of that feeling I get while reading it into the novel. Thank you for this. I don’t comment as much on your blog as I should, but hey – I have time now… vacation and all, ya know? And this goes down as one of my favorite comments ever! Thank you so much for your kind and evocative words.